This peak is #13 on the Height List for Nevada . 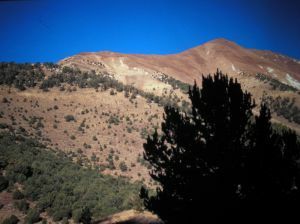 This peak is #8 in Prominence List for Nevada .Arc Dome is the highest peak in the mostly gentle and isolated Toiyabe Range in central Nevada. From Columbine camp in the NW a 10 km long trail leads to the summit. The trail intersects the more than 100km long Toyabee Crest Trail which swings around the west, south and eastside of the mountain.